This square is Place de l'Hotel de Ville, although a leaflet I've got calls it La Place de la Mairie for some reason. The square is dominated by the Town Hall (1655-1670), featuring a fine facade in the Italian style, carved wooden doors and an inner court. The Clock Tower, once the town belfry, has an astronomical clock (1661), on which statues representing the four seasons appear in turn. 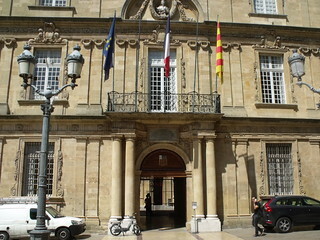 This is the Hotel de Ville (City Hall) in Aix. L’Hôtel de Ville (City Hall). This classic building overlooks the the square and to date is the center of city's activities such as flower markets, parades and feasts.